Ayre Hoteles is the first Spanish hotel chain being launched with trivago Express Booking, thanks to technology provided by Mirai, a hotel technology company dedicated to supporting hotels in optimising their distribution for greater revenue and a better user experience. We recently spoke with Mirai CEO Pablo Delgado to get his take on hotel technology and distribution. His perspective on the challenges today’s hoteliers are facing, the importance of metasearch and metasearch marketing, and how tools such as trivago Express Booking can be used to drive direct bookings proved especially insightful. Read on for the full interview below. trivago: Hi Pablo, and thank you so much for this interview. Could you give our readers an overview of the services that Mirai offers both independent hotels and hotel chains? Pablo: We work with the hotel to reduce its distribution costs and thereby increase its revenue, as well as to minimise its third-party distribution dependencies. To accomplish this, we cover the following three areas: creating and maintaining the hotel’s platform for direct bookings (website, mobile functionality, and booking engine); promoting and marketing this platform so that the guest, who would otherwise never find it, lands on it; and, most importantly, assisting the hotel to develop a real direct-booking strategy with specific actions to be executed with calculated timing — a roadmap for them to follow. As a travel-industry professional with more than 20 years in the business, what do you consider to be the most significant changes in the hotel distribution landscape in recent years? Online hotel distribution is changing from year to year, and this is, without a doubt, to the benefit of OTAs and the detriment of direct sales. The former are experts at adapting to market changes — it is in fact their core business. Hotels on the other hand are much slower to react, and with each change they don’t adapt to, they lose more ground in their battle against dependency on distributors. We see changes every six months, but of those that occurred over the last 20 years I’d go with the unstoppable and spectacular rise of mobile devices; the hotels’ loss of control over their final prices (and few know how to solve this problem at the root); the arrival of metasearch sites, which are here to stay; and finally, in recent years, the battle for customer loyalty, in which, once again, it’s the distributors that are winning. You’re a hotel technology provider for both independent hotels and chains; what technology challenges have you seen the industry struggling with in recent years? Hotel searches are now happening on mobile devices, on tablets and smartphones, and so the industry faces not only the technical challenge of adapting its technology, but also the conceptual one of winning these users who are on their phones as they walk down the street, navigating with maps, using apps, and interacting with social media all at once. It goes beyond mere technology. Everything is now connected with everything else: Property management systems, CRMs, booking engines, channel managers, metasearches. . . . Creating and maintaining all these integrations is expensive and not feasible for many hoteliers. From the start, Mirai bet on having the best integrations with metasearches; I think it’s really paid off. Our most recent example is trivago Express Booking. Loyalty: another pillar the hotelier doesn’t know how to deal with. While the technology problem is quite advanced (though there’s still much do be done), the real issue is the hotel’s lack of mobility in solving it, leaving the field wide open for intermediaries to come in and claim guest loyalty for themselves. In your opinion, what’s the perfect combination of factors for an independent hotel or a chain to have the best results from a metasearch marketing campaign? We know that an optimised landing page and rates affect a campaign’s performance and success at driving direct bookings; what other factors can as well? Inventory. It might sound absurd, but many hotels enter the world of metasearch with poor inventory management, and are then disappointed by the low amount of sales they’re able to generate through these sites. Without inventory nothing can happen: neither direct bookings, nor indirect bookings from OTAs. Rate control. No distribution channel should advertise rates that aren’t approved by the hotel. This means stepping up and facing the least transparent channels, such as wholesalers and some OTAs. Ideally, having better rates than the OTAs. If you’re able to show a better rate than major booking sites, your marketing campaigns on metasearch will be much more profitable. Having the best integration technology. Many companies try to commodify integration with metasearch. It’s a mistake. We dedicate a lot of resources to setting up and managing our integrations with metasearches, making sure they function for searches for family-friendly rooms, that they work with the latest versions of metasearches like trivago with Express Booking. . . . When a company claims to have integration with trivago, you should ask: Does it show prices per markets? Family-friendly rooms? Is it integrated with trivago Express Booking? And like you’ve said, an optimised landing page and a competitive booking engine. It would be a shame to do all the above only to lose the guest when the sale is almost in the bag. 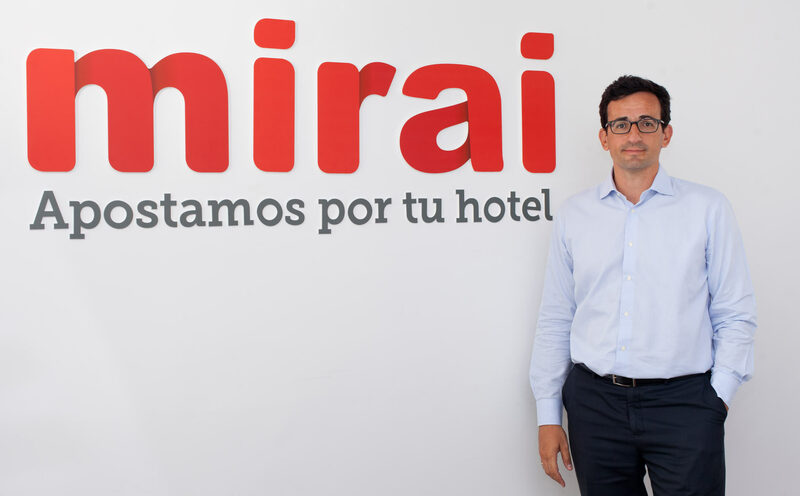 Mirai is the first technology provider in Spain to implement trivago Express Booking to improve both the hotel’s conversion rates and the user’s experience during the booking stage. What other advantages have you seen with this product in running successful metasearch marketing campaigns? Without such products, the unfortunate reality is that the number of users who ultimately complete their booking after going to the hotel website or OTA site drops significantly, especially when they’ve started their search on a mobile app. The reason is that the change in the “look and feel” of the new window is uncomfortable for the user, especially on mobile devices where everything is more complicated. The objective of products such as trivago Express Booking is to eliminate this “friction,” especially on mobile devices, to make the user experience easier and more streamlined. On top of that, with their first booking via trivago Express Booking, users can select to have their data saved, meaning they won’t have to fill out the form again, making subsequent bookings even easier. Unlike similar products, trivago Express Booking offers the advantage of having the hotel’s logo visible at every stage, allowing the user to leave the site and continue on the hotel’s website at any point. This is, to this day, unique. What results do you expect to see from trivago Express Booking? Greater success for the hotels already on trivago, so that they can reduce their commission costs and thereby increase their revenue. This in turn would motivate more hotels to participate and benefit from having their website rates visible on trivago, enabling them to receive direct bookings that would otherwise go to OTAs. What was your reason for integrating your hotels’ inventories through trivago Express Booking? We actively recommend to our clients to participate with their website rates on every platform they’re able to be present on, as part of a strong distribution strategy. trivago, as one of the most important hotel metasearches and one that is gaining visibility, is for us a strategic partner. We integrated trivago Express Booking so that hoteliers could have the opportunity to get connected and increase the visibility of their website rates and, thanks to an improvement in their conversion, reduce their distribution costs. Additionally, since Mirai is the first partner in Spain to connect with trivago Express Booking, we remain in the best position to offer the most complete redistribution service for hoteliers. As a technology provider that works continuously to improve the user experience during the booking stage, what does Mirai consider most important when developing improvements to facilitate the booking process? We’re in the year 2017 and the main problem of the hotel is not how to go about improving the booking process, but how to eliminate the noise surrounding potential guests. This means ensuring that guests always find the best rates on the hotel’s website, and not on a third-party booking site. There’s no experience worse than deciding on a hotel and going to the official website only to find a worse price than what an OTA lists. The potential guest, in addition to being confused, will think the hotel is not smart about running their business. After that’s taken care of, the hotelier has to focus on their home, which means making the guest experience as easy and comfortable as possible. It’s not something you do once and then forget about. It’s not updating your technology every two or three years. It consists in improving continuously, one little step at a time, testing and measuring the results of what you’re doing as you go. At Mirai, we never stop updating our booking engine, delivering with every little change (some not even noticeable at first sight) greater power and functionality, and we gauge the difference to be certain we’re on the right track. How can a hotel that’s already working with Mirai have its website rates visible directly on trivago? The hotelier just needs to contact their Mirai account manager. Our online marketing team will take care of doing a preliminary study of the markets in which they’d like to participate, estimating how much they should invest, and closely following the campaign to optimise its results.